There really is such a thing as tick spit - that is, the saliva of a tick. And there's something about it that might help fight heart disease and stroke. The link comes from a protein found in the spit of ixodes (ik-SO-deez) ticks, which are also known as blacklegged ticks, or deer ticks. 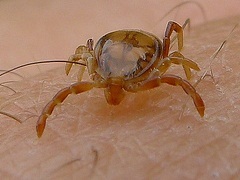 These kinds of ticks tear their way into skin and feed on their host's blood for several days. They damage small blood vessels, which would normally trigger the body to start a process called coagulation - or blood clotting. Clotting is important because it stops bleeding. But it also can play a role in heart attacks and strokes. That leads back to the ticks, and their spitting. These ticks spit where they bite their host. In doing so, they project a protein that blocks the body's natural clotting process; it happens similar to the way blood thinners - or "anticoagulants" - work. The new thing researchers have learned is that the two clotting factors, called factor X and factor V, that get blocked by the tick spit end up working together and activating a third clotting element, so the clotting eventually happens. Scientists already knew which coagulation factors are able to activate Factor V but they didn't know that factor X was extremely important in this process. Thanks to these ticks - and their spit - we have a better understanding of the clotting process. The result is a new model for blood coagulation, which is an important discovery for our understanding of how clots are formed, why certain anti-clotting drugs help and how new drugs could be developed. Imagine all that information from those little ticks, and their spit.